A town mentioned by Ezekiel (xxvii. 8, 11) as having contributed materially to Tyre's commercial greatness. Men of Arvad rowed the ships and manned the walls of Tyre. In the genealogical list of Gen. x. 18, and in the corresponding list of I Chron. i. 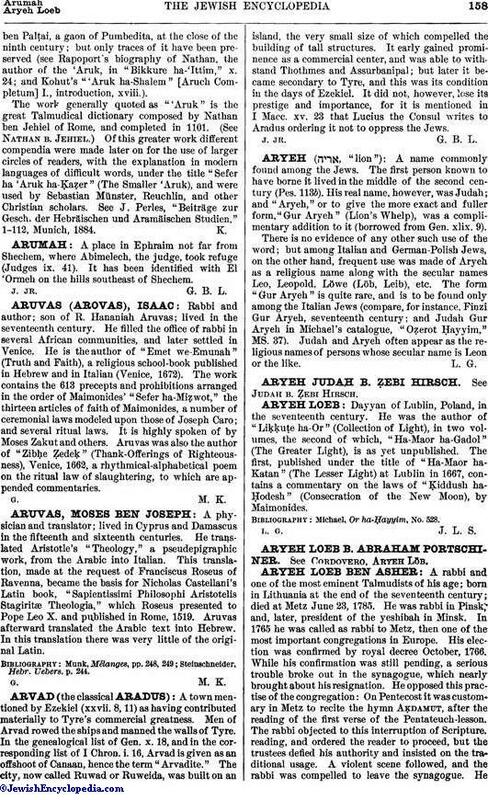 16, Arvad is given as an offshoot of Canaan, hence the term "Arvadite." The city, now called Ruwad or Ruweida, was built on an island, the very small size of which compelled the building of tall structures. It early gained prominence as a commercial center, and was able to withstand Thothmes and Assurbanipal; but later it became secondary to Tyre, and this was its condition in the days of Ezekiel. It did not, however, lose its prestige and importance, for it is mentioned in I Macc. xv. 23 that Lucius the Consul writes to Aradus ordering it not to oppress the Jews.